If you already have a toaster and towels, pledging your big day would give a family with a seriously ill child precious time together. Every £182 raised gives a family a whole day of support from a Family Support Worker, while they are struggling to cope with ordinary life in their extraordinary situation. £1,780 covers the cost of supporting a family for a whole year while their child receives potentially life-saving treatment. If you are asking for donations in lieu of gifts or donating instead of giving wedding favours, we have handmade place cards to personalise so your guests know that they are helping to support a cause close to your heart. If you’d also like to personalised donation envelopes, just let us know and we’ll send you what you need. 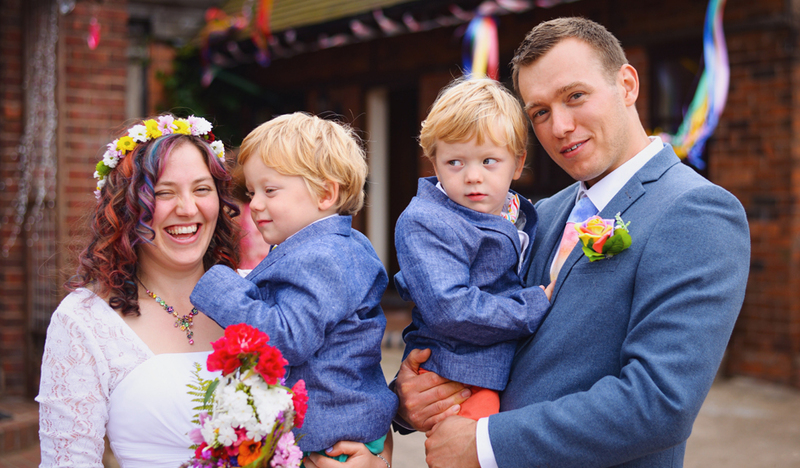 Tell us about your big day using the form below and we’ll send you our Big Day Pack with more ways you can support Rainbow Trust while you celebrate, including place cards and bunting. Why have you chosen to support Rainbow Trust? ​We have everything you need, from Rainbow Trust bunting, place cards and more.